What a great year! Thanks so much to all of you for your hard work in 2014. We really appreciate it, and hope you all enjoying ringing in the new year with family and friends tomorrow. 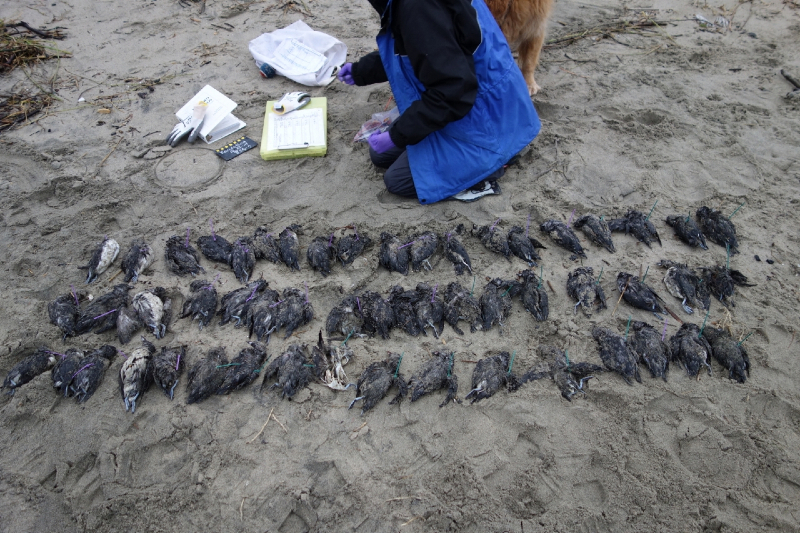 It’s been a busy few weeks at COASST with many Cassin’s Auklets washing in to the Pacific coast. We’re in the midst of a once-in-a-decade wreck which started in late October in the south and recently (re)pummeled Oregon and Washington. The full story is featured on our blog. If you have any questions on the wreck protocol, just let us know. A big thank you to all of you who have helped to document this event. On AL1, wing chord is less than 15cm, so Small Alcid AND bill is dark with (pale) spot at base. Webbed (go to Q2), completely webbed (go to Q3), 4 toes, 3 webbed, 4th free (go to Q5), tarsus not more than 12mm across (go to Q6), thin toe only (go to Q7), swollen heel: Larids (LA1). Bill hooked (gulls and kittiwakes – flip to LA2), wing with gray-to-white wingtips and primaries with big, central, white spots (aka “windows” – see left wing – the white spots on the ends of the primaries are “fingernails”). Glaucous-winged Gull! Bill hooked (gulls an kittiwakes – flip to LA2), gray wingtips – Glaucous-winged Gull! Bill hooked (gulls – flip to LA2), foot color pale (not black), large adult gull. 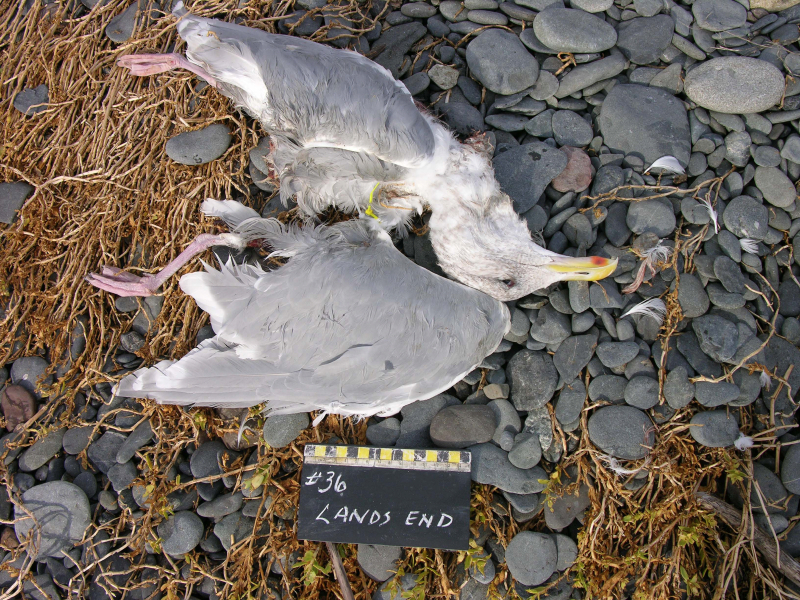 We’ll find it quickly – Glaucous-winged Gull is the only one with gray wingtips. Webbed (go to Q2), completely webbed (go to Q3), 4 toes, 3 webbed, 4th free (go to Q5) tarsus is more than 12mm across: Loons (LO1). Bill is less than 60mm, so small loon: Pacific Loon or Red-throated Loon. Measurements overlap for both, so let’s turn to the “similar species” section of the Pacific Loon (LO2-LO3). Eye is in the dark plumage of the face, back has few spots. Did you notice those white squares at the shoulders? It’s a Pacific Loon! Recent storms brought big changes to many beaches, from increased amounts and kinds of marine debris to altered beach zones. Alan and Kathie who survey Graysmarsh noted that the wood zone doubled in size from their November survey and all kinds of stuff was caught – tennis balls, flip-flops, chunks of foam, and bottles. 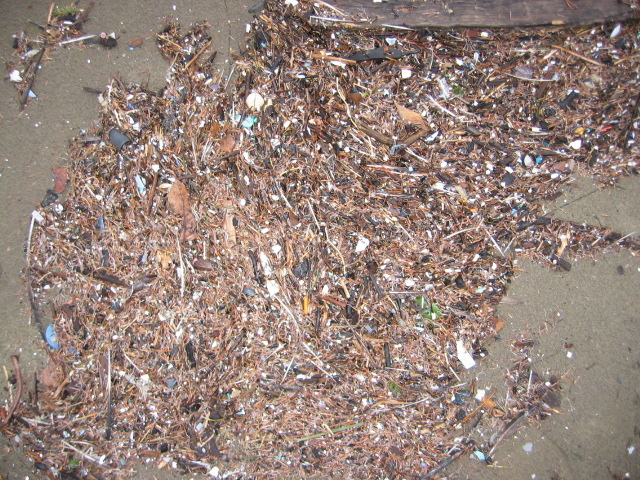 Following his bird survey at Beverly Beach Campground North, Lloyd sent in this photo, explaining that the 1600m long, recently deposited wrackline was littered with tiny pieces of plastic. 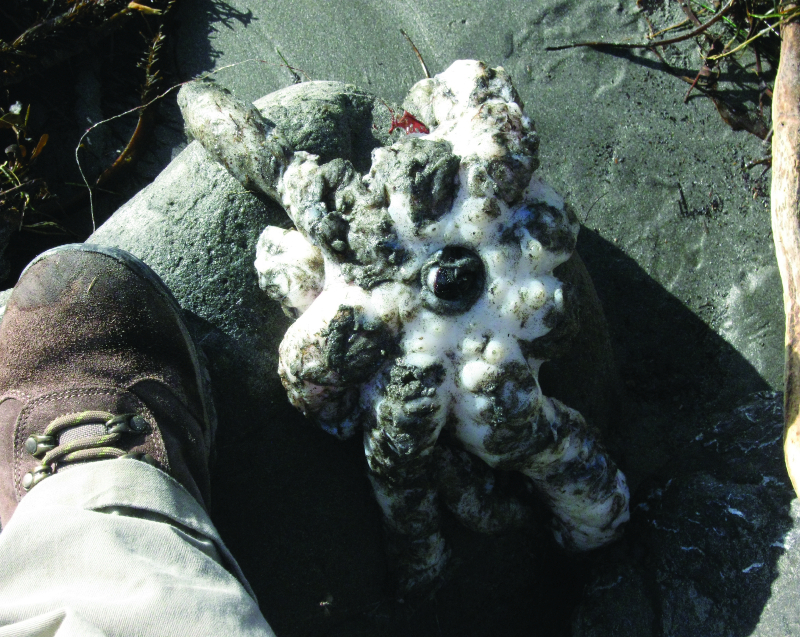 Take a look at what Valerie found at Trinidad Lighthouse Beach this month. Lovingly referred to as “octopus goo,” this photo shows the underside of the octopus, where we see the mouth or “beak.” This beak is composed of chitin (just like our fingernails and hair) and is the only hard part of their body. No wonder they can squish though such tiny spaces! Still hung up on whether it’s octopuses, octopi, or octopodes? Check out this fun video from Merriam-Webster. 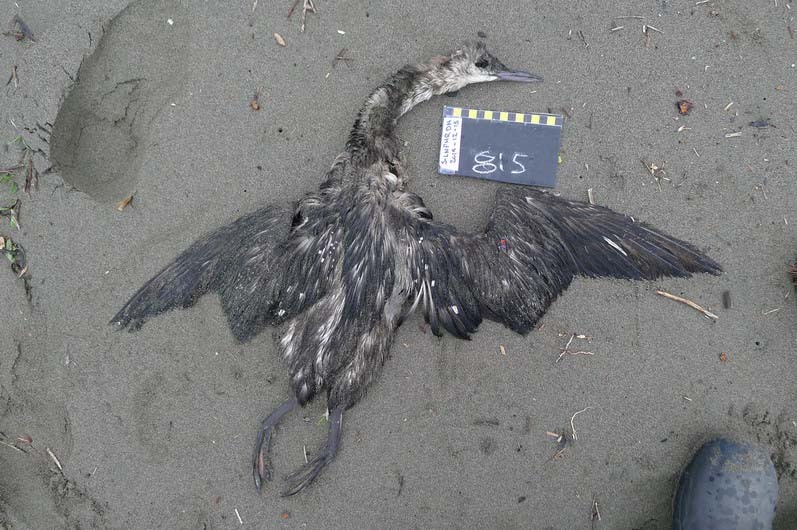 This entry was posted in Uncategorized and tagged Cassin's Auklets, Marine Debris, once-in-a-decade wreck, Pacific Loon on 30. December 2014 by coasst.